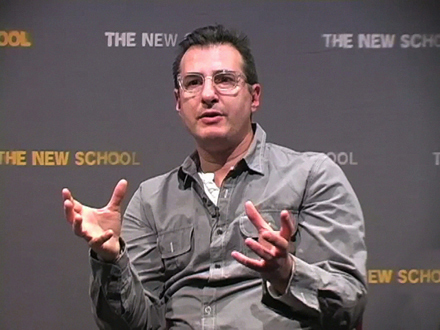 Jon Robin Baitz participating in a town hall discussion at The New School for Drama. Neil Patrick Harris wasn’t the only notable at Sunday night’s Tony Awards—The New School earned a few moments in the spotlight too, with two members of our community honored by the American Theatre Wing’s annual celebration. Nina Arianda, (BA, Liberal Arts ’06, Eugene Lang College) won best actress for her starring role in Venus in Fur and Jon Robin Baitz, head of The New School for Drama’s playwriting department was nominated for best play for Other Desert Cities. In Venus in Fur, a taut, comic pas de deux, Arianda portrays an aspiring actress who targets her director’s sexual curiosities to nail a role. Arianda, who earlier this month was also honored with a Lily Award for women in theater, has been rapturously praised for her performance by everyone from the New York Times (“Nina Arianda gives the first must-see performance of the Broadway season”) to Mike Nichols, who likened her to a young Meryl Streep. Arianda’s senior advisor at Lang was Assistant Professor of Theater Cecilia Rubino, who remembers her as student who was “not only passionate about her craft as an actor, but passionate about being engaged in the world and taking on social justice issues.” For her senior work, Arianda helped to produce and perform in Becoming Natasha, a piece about human trafficking. Other Desert Cities also explores topics often left politely unmentioned: political upheaval, suicide and family secrets. They all come to the fore in in Baitz’s play, in which the Wyeth family reunites for Christmas—and estranged daughter Brooke threatens to publicly rehash a long-distant family tragedy. The play, whose star-studded cast includes Stockard Channing, Stacy Keach, Judith Light and Elizabeth Marvel, is directed by Joe Montello, The New School for Drama’s 2011 Artist-in-Residence. One of the best-reviewed plays of the season, Other Desert Cities has been honored with the Drama League Award for Distinguished Play. Arianda and Baitz’s Tony nods speak to the The New School’s longstanding influence on American theatre. In the 1940’s, The New School provided the setting for Edwin Piscator’s famous Dramatic Workshop in the 1940s, which trained luminaries including Marlon Brando, Harry Belafonte, Elaine Stritch, Tennessee Williams. This tradition lives on in the graduate programs of The New School for Drama and the undergraduate drama program at Eugene Lang College.